LESSON 1: Why Study Weather? SWBAT explore and analyze real-world data to explain the interaction of Earth's surface and atmosphere, warming caused by greenhouse gasses and changes in atmospheric carbon dioxide levels in the atmosphere over time. What is causing an increase in atmospheric temperatures? Ask questions to clarify evidence of the factors that have caused the rise in global temperatures over the past century. Students are quick to answer that increased carbon dioxide stemming from the use of fossil fuels is a likely cause of global warming. Yet when students are asked to explain exactly how the carbon dioxide causes global warming they are unsure how to answer. This lesson uses simulations to help students construct their understanding of how carbon dioxide contributes to the Earth's temperature changes. 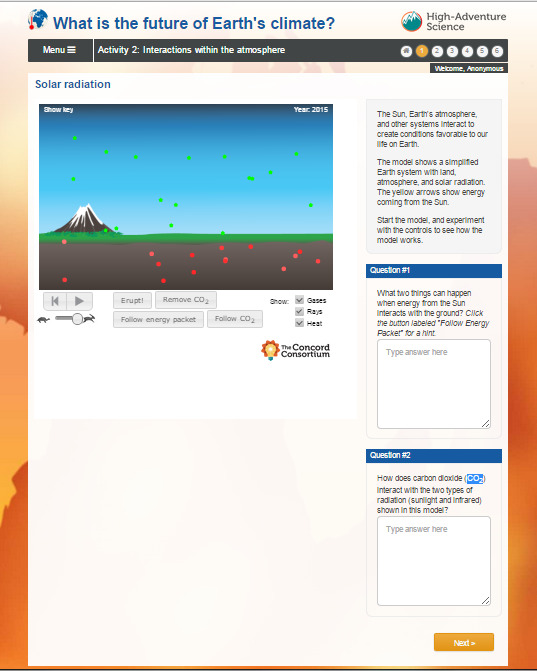 The High-Adventure Science - Activity 2 Interactions Within Earth's Atmosphere presents to students a short written explanation along with a an interactive simulation for students to examine and analyze. Boxes are provided for students answers. As the facilitator of this activity, I can run a report at any time to view student responses for all students, one student, all questions or one question. There are two methods to enroll your students in this activity. Enrollment is required to record student responses. One method is to enroll students yourself. Using this method, you enter student names and create their user name / password. I complete this process for one class. For all the other classes, I had the students self-enroll. This lesson uses the High-Adventure Science activity - What is the future of Earth's climate? developed by Concord Consortium. "Interaction Within Earth's Atmosphere" High-Adventure Science. Concord Consortium, 2015. Web. 23 May 2015. It is likely that human activities, such as the use of fossil fuels, have created greenhouse gasses. These greenhouse gasses are the likely cause of climate change. But how exactly does this happen? Students are puzzled by this question. They can explain that human activities are the likely cause of climate change. However they cannot explain how the greenhouse gasses cause changes in temperature. I explain to students that in this lesson, they will learn how the Earth's atmosphere warms because of greenhouse gasses and what role solar radiation plays as it interactions with the Earth's surface and atmosphere. In this simulation, you will be asked to change variables to observe how changes affect the system. When you answer the questions, you will provide evidence to support your answers. I model how to change the variables on the first simulation. Students can change the speed of the simulation, what is shown (gasses, rays and heat), cause the volcano to erupt, remove or follow CO2. I encourage students to take their time to "play" with the simulations and variables not just to answer the questions but to be able to explain to others what the relationship is between temperature and atmospheric CO2. If you need to clarify your understanding it is perfectly acceptable for you to confer with the scientists at your table group. You may also ask me any clarifying questions you have about the lesson. The website provides suggested answers to each question. I use these notes as I circulate around the room as students work. I like to work with my students one-to-one or small groups. The High-Adventure Science format also allows me to run a report at any time. The reports can be generated for all students or one student, all questions or a single question. In the resources section you will find a sample report generated at the end of each section. My students select the print option and select PDF as their printer. The PDF responses are then shared with me via Google Drive. This short video shows how the computation models help build student confidence in their understanding of the material presented in the simulation. For this lesson, I am conferencing with individual students. As I look at the answers, I search for unexpected or incomplete responses and then follow up with individual students. I want to make sure the student understands how to use the simulation and interpret the change in variables appropriately. This TEDEd Climate Change: Earth's Giant Game of Tetris video draws together today's lesson. Human activity has created an interlocking set of conditions much like the game of tetris. In the next lesson - Sources, Sinks, and Feedbacks - students examine feedback loops in the context of climate change. This video helps prepare students for the next lesson by creating the analogy between something they all understand - Tetris and the complicated interactions involved in climate change. Heat and Pressure in the Atmosphere.